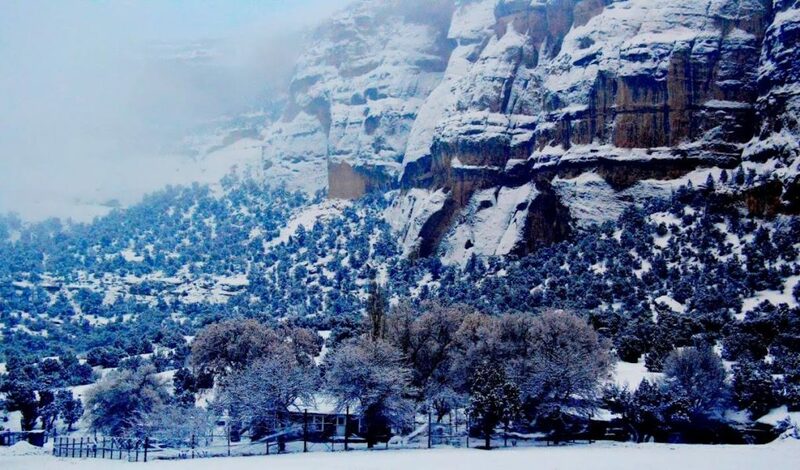 The Ranch is located in Colorado near its western border with Utah and its northern border with Wyoming. 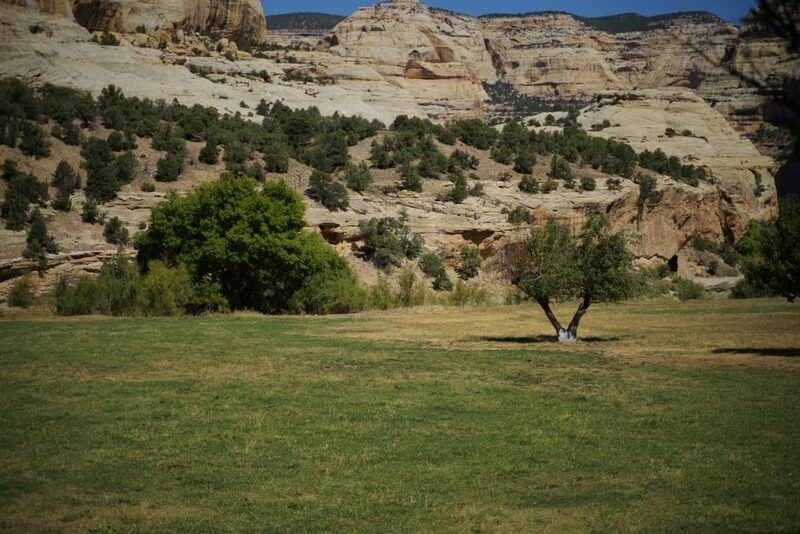 The Ranch is a private inholding within the Dinosaur National Monument. Remote and wild, the ranch is accessible via gravel county roads. The nearest air service is 77 miles west in Vernal, Utah, with a 7,000 ft. asphalt runway. The Yampa Valley Regional Airport near Steamboat Springs, Colorado is 100 miles to the east. Salt Lake City International Airport is 250 miles west of the ranch. 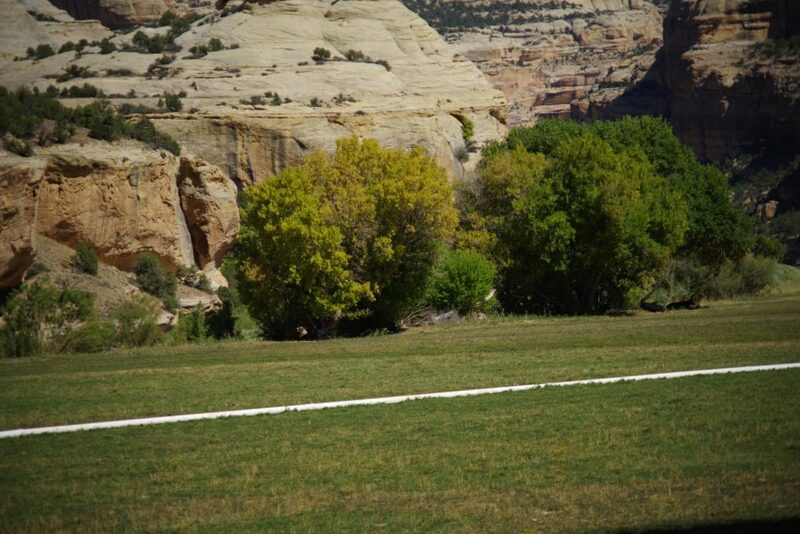 One of the more remote locations in the United States, the ranch is beautiful and private. The Ranch consists of two non-contiguous parcels. 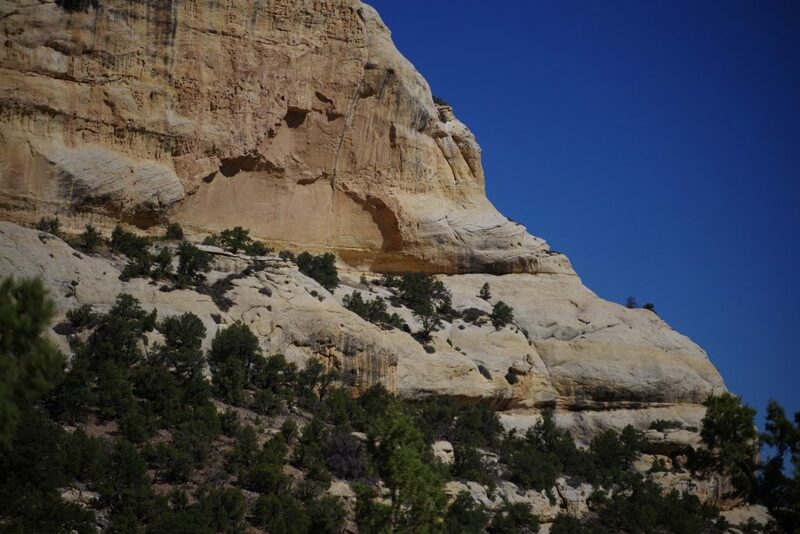 The 164+/- acre Mantle Ranch Parcel is a couple of miles east of the 360+/- acre Red Rock Parcel. 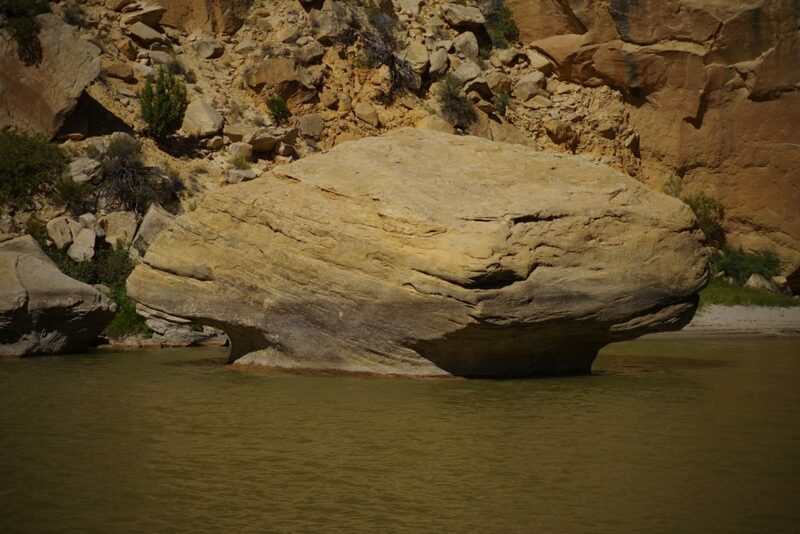 The Mantle Ranch is in the area known as Castle Park with an aptly named rock formation shadowing a flat, open park. 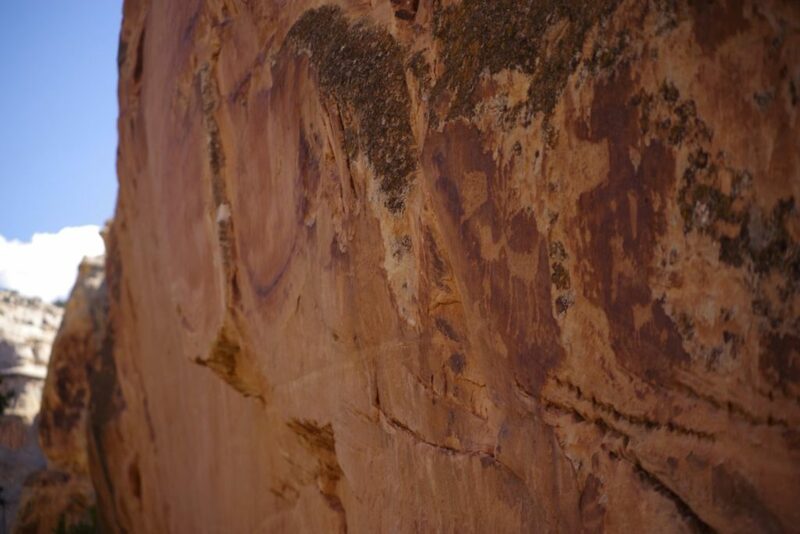 The sheer rock face of 300 million-year-old Weber Sandstone provided a canvas for the early nomadic Indians and more recently provided a wall for homestead cabins where materials were scarce. The park is the convergence of the mouth of Hells Canyon and the Yampa River. Hells Canyon is a long, deep gorge that slices through the mountain top exposing some of the oldest rock on Earth. Wild spring runoff carries loads of sediment as it drops a fast 2,000 feet from the old Mantle summer camp to the Yampa River. The river flows through this parcel for approximately 3,000 feet and provides the water for irrigation of the fertile meadows flanking the riverbanks. Approximately 20 acres are irrigated by flood irrigation and a small pivot. 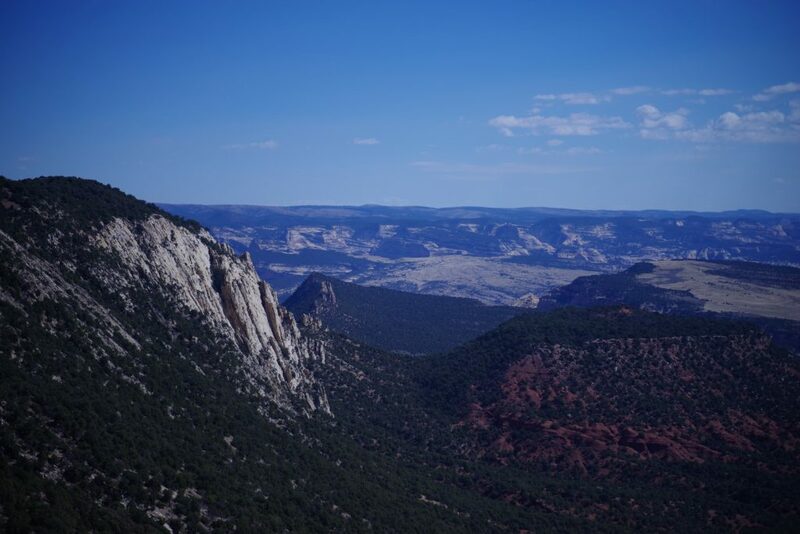 The Red Rock Ranch parcel consists of 360+/- acres at the mouths of Cottonwood Canyon and Red Rocks Canyons on the Red Rock Bench. Several area springs provide livestock water and attract wildlife. 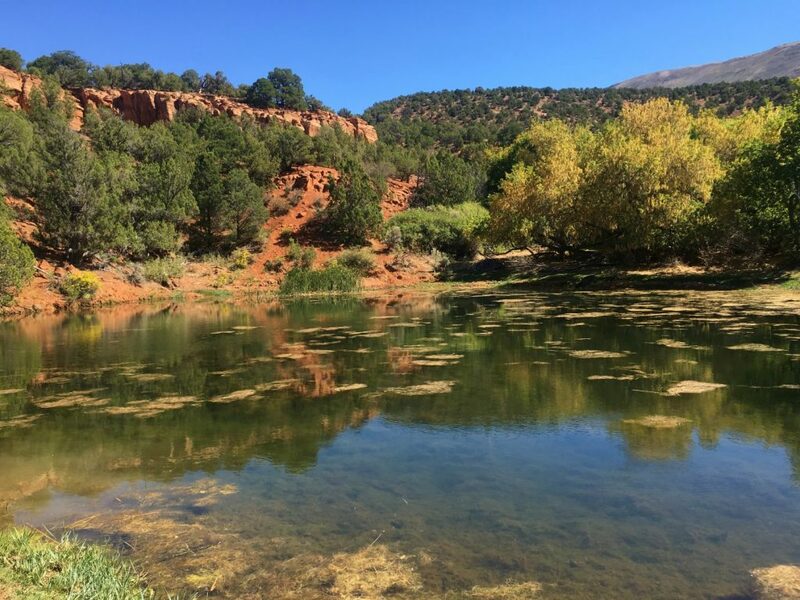 A spring-fed pond rests in the shade of a deciduous tree grove that also serves as a landmark in the vast expanse of pinyon and juniper. The expansive view from this parcel is a vividly colored landscape shaped by millions of years of wind and water artfully rearranging the Earth’s surface. Both parcels were subdivided by the Mantle family in the early 2000’s. No action has been taken to subdivide the ranch however both plats have been filed and approved by Moffat County. 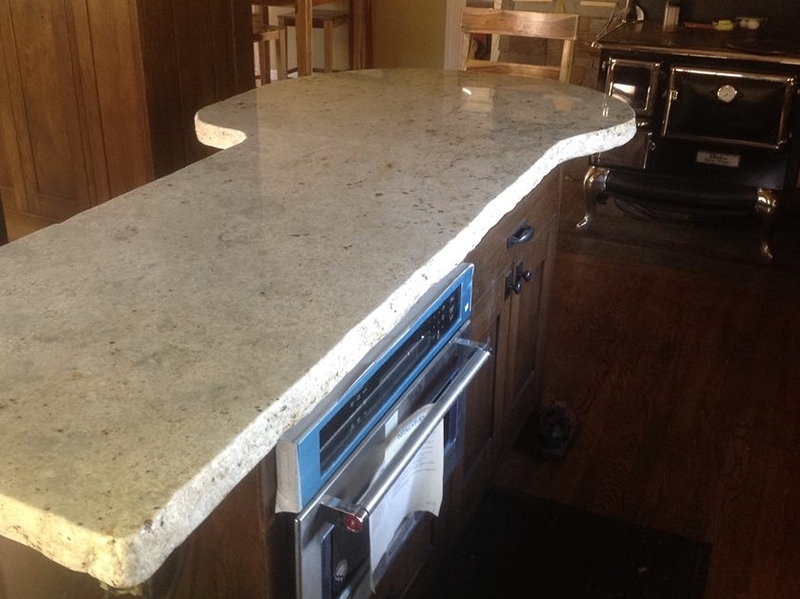 The home, built in the 1940’s by the original homesteaders, has recently been remodeled. 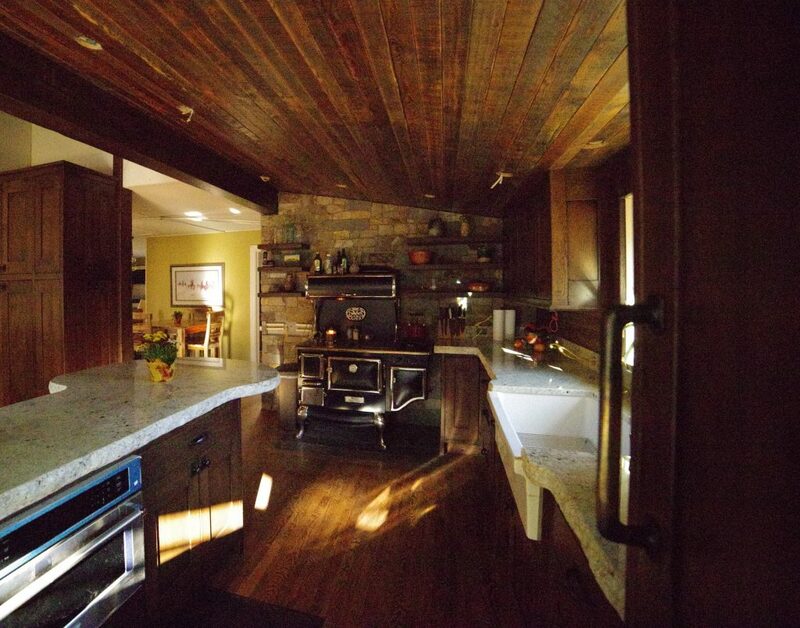 The current owners have updated finishes, replaced windows and remodeled the kitchen and bathrooms. 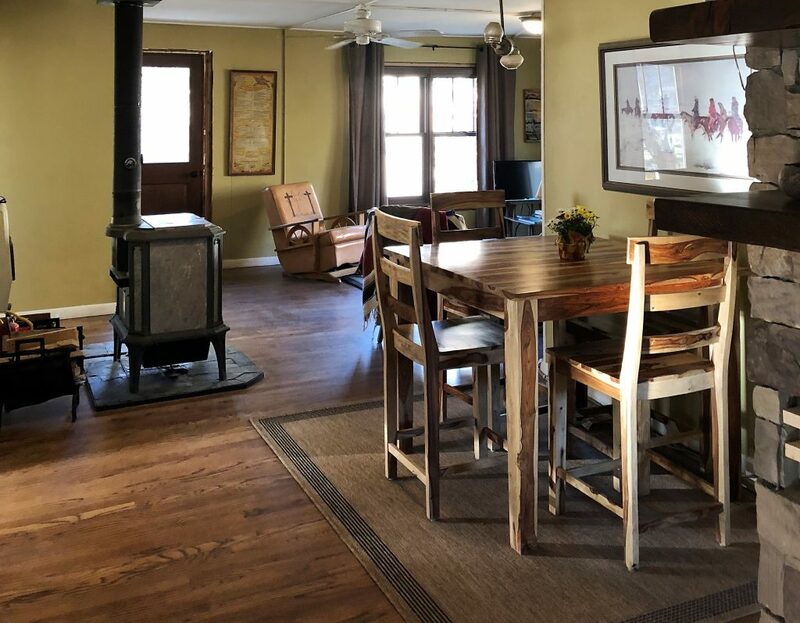 The comfortable home has four bedrooms and is nestled in the trees between Castle Rock and the Yampa River. The south wall of the barn outbuilding is a sheer rock face; the wall conforms to the contours of the rock, a fascinating and practical architectural feature! Although updates have been made and conveniences have been added, the history of the original settlers has been preserved. New corrals and a horse-shelter complement the original pinyon and juniper corral poles built by the Mantle’s. Hand-dug irrigation ditches are augmented by a new pivot. Miles from the nearest utilities, a new state-of-the-art solar system provides the convenience of electricity and satellite internet connects the ranch managers to the outside world. 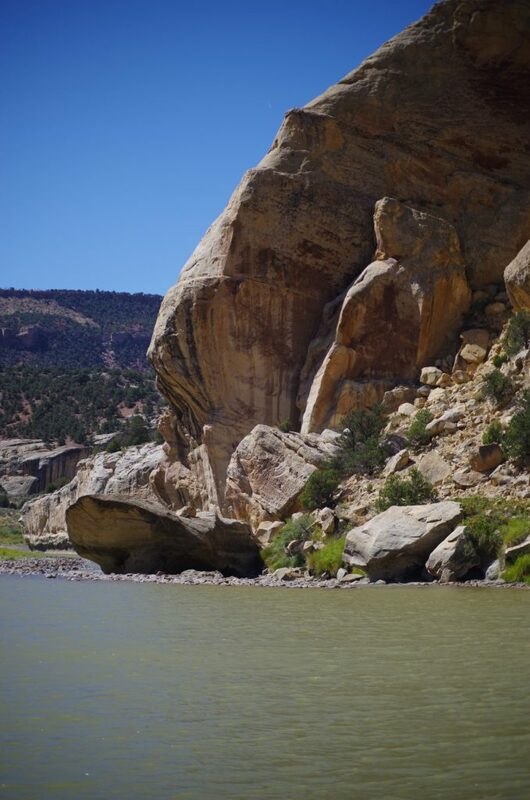 Fishing, rafting, hiking, riding, and rock climbing are easy to enjoy on the ranch. A 220,000 acre non-motorized playground is just outside the ranch boundaries! Limited hunting in GMU 10 may be available on the privately held lands within the Monument. The unit is a closely managed draw-only area and generally requires many years of preference point accumulation for both hunters and landowners. Those lucky enough to draw in this unit are often rewarded with successful hunts and harvest bulls that are among the largest in Colorado. 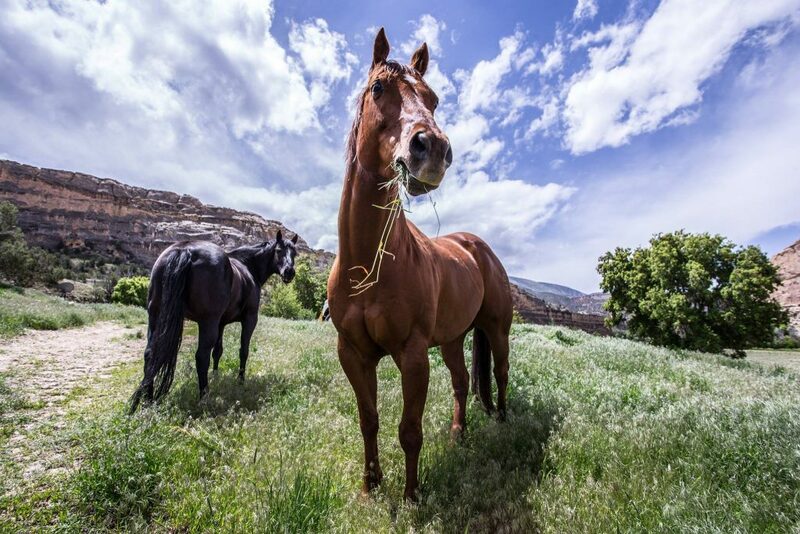 Since the original settlers, the ranch has been operated as a horse and cattle ranch. Those operations continue today on both of the deeded parcels and on the Yampa Bench (Red Rock) Allotment. An Act signed in 1960 that revised the boundaries of the Monument and provided an entrance road also addressed grazing rights. 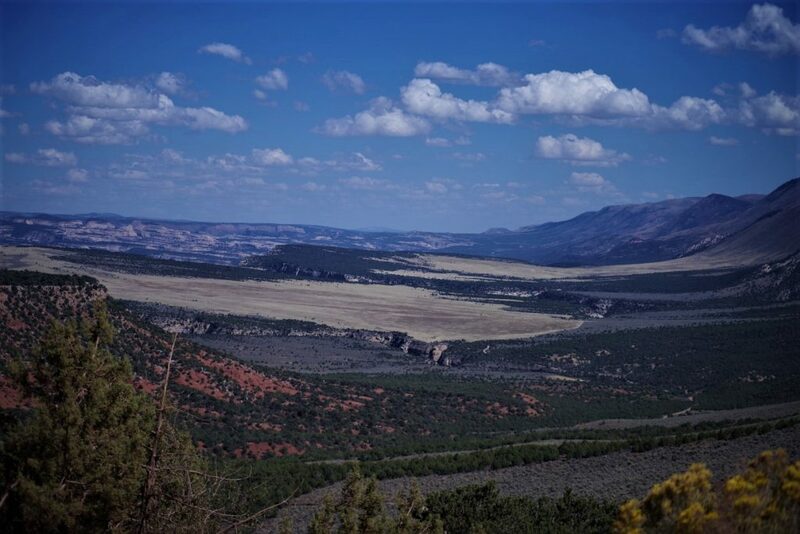 Section 3 of the Act provided that grazing rights appurtenant to privately held lands within the Monument shall not be withdrawn until title is vested in the United States, except for failure to comply after reasonable notice of default. The 358 AUM allotment provides year-round pasture for cattle and horses on the adjacent National Monument land. In addition to the ranching operation, the tradition of welcoming groups for education and preservation of the regional treasures also continues. The current ranch managers admittedly enjoy a few modern conveniences but their love for the ranch, the setting, and the history is unchanged from their predecessors. 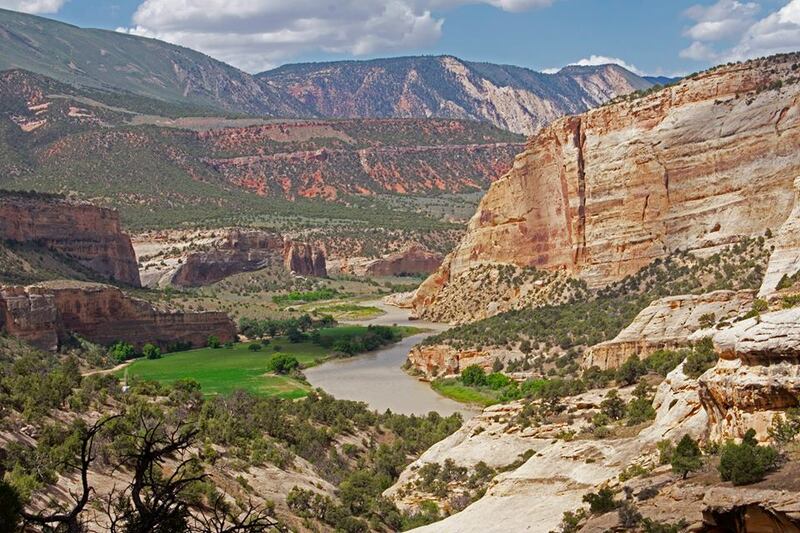 The Ranch is located at the tail end of the Yampa River, near its ecologically significant confluence with the Green River. 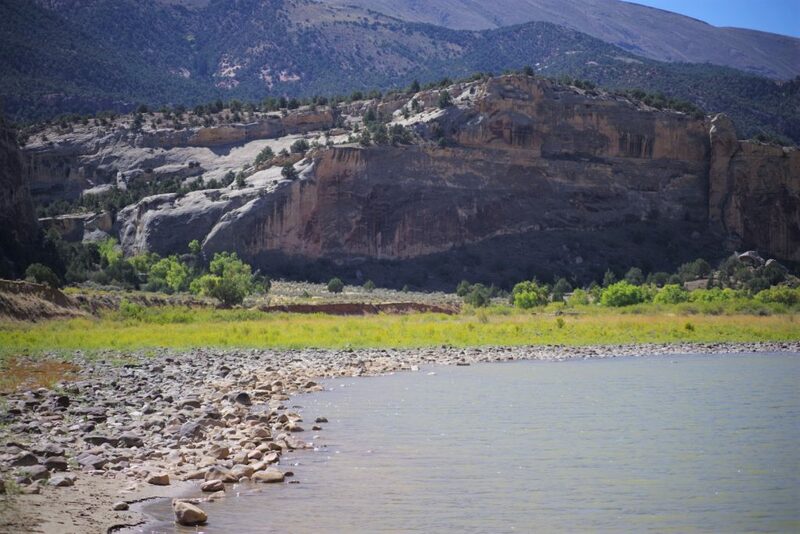 By the time the Yampa has flowed from its headwaters in the Flattops Range a hundred miles east, it has provided irrigation water for numerous upstream ranches of the Yampa Valley in Routt and Moffat Counties. The river also provides endless opportunity for fishing; it provides an avenue for boaters as they float through vast, relatively unchanged lands; and it provides the ultimate cleanse as it picks up and redistributes soil on its way by the fertile meadows of Castle Park. In addition to the significant stretch of live water flowing through the Ranch, adjudicated water rights appurtenant to both parcels will convey. 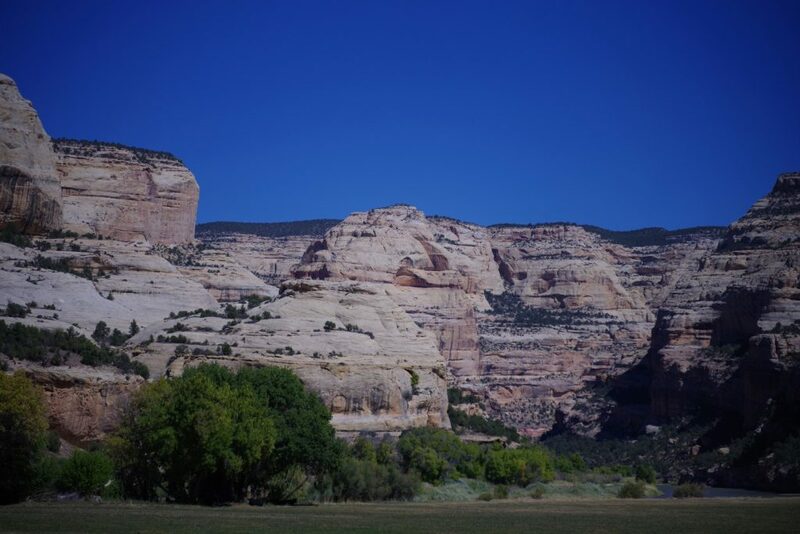 This area of Northwest Colorado is known for its remote location, unusual scenic vistas, highly variable topography, interesting geologic features and fascinating history. Once frequented by outlaws like Butch Cassidy and Tom Horn, the area is rich in tales of our nation’s westward expansion. The small town of Dinosaur with a convenience store, park and visitor center supplies fuel and the most basic of groceries. Vernal, 33 miles west of Dinosaur, is the nearest population center with shopping, restaurants and grocery stores. Fresh off of his World War I service in charge of the Unites States Cavalry, Charley Mantle returned to the Vernal, Utah area in search of a place “so remote he’d never have to be crowded with people again.” Eventually he found that place: protected and fertile green parks along the river that had carved gorges a thousand feet deep through the sagebrush covered plateaus. 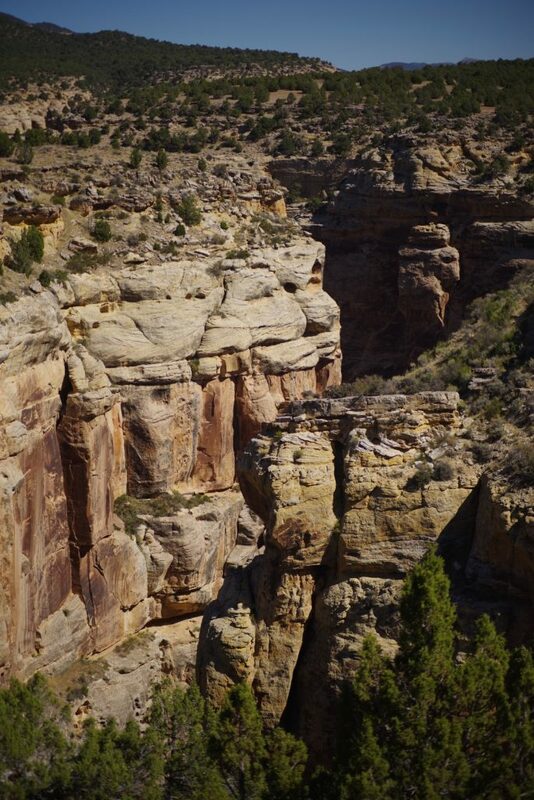 He purchased the homestead rights from an old man holed up in a canyon in 1924. He paid cash for the ranch and a few cows and put his horsemanship skills to work on the free roaming wild horses on Blue Mountain. He built a one room cabin with a dirt floor and sod covered roof. He built corrals for breaking his horses; the remnants of both remain today. In 1941, a new house was built. Updated with modern amenities, the house is enjoyed today from its site overlooking the river, the orchard and the meadows below. Today, the ranch has county road access, a monumental improvement from the treacherous horse trails originally used by the Mantle family. 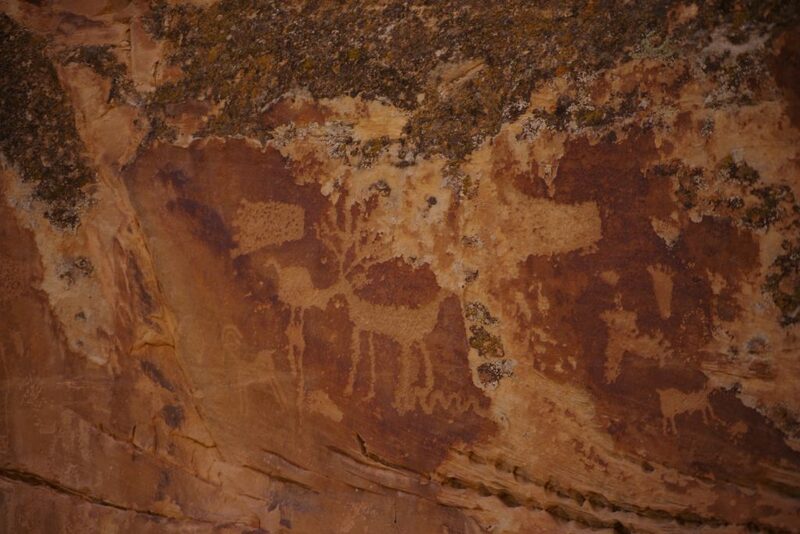 The Mantle Ranch was host to many expeditions as researchers studied and documented the art, artifacts and lifestyle of the Fremont Indians (AD 200-1300). 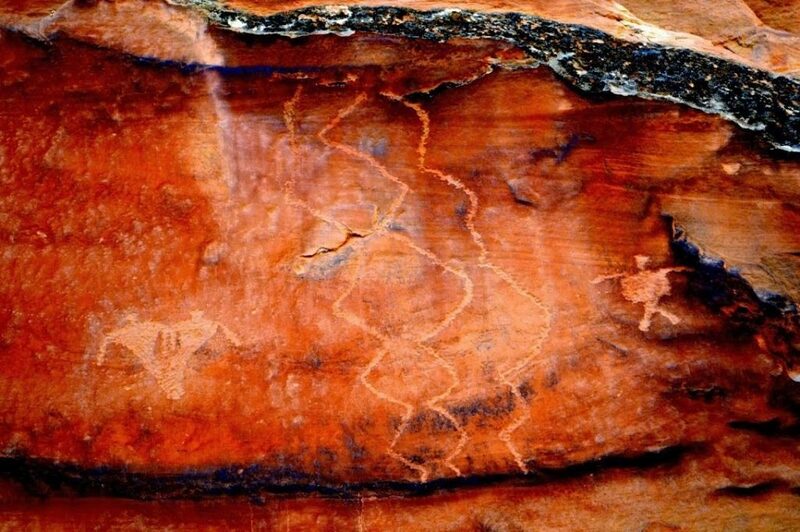 Their petroglyphs and pictographs have been found across the entire region and The Mantle Ranch boasts one of the largest privately owned collections of petroglyphs in the United States. The United States reserved the coal and other minerals on 200 acres. All minerals owned by sellers on remaining lands will convey. 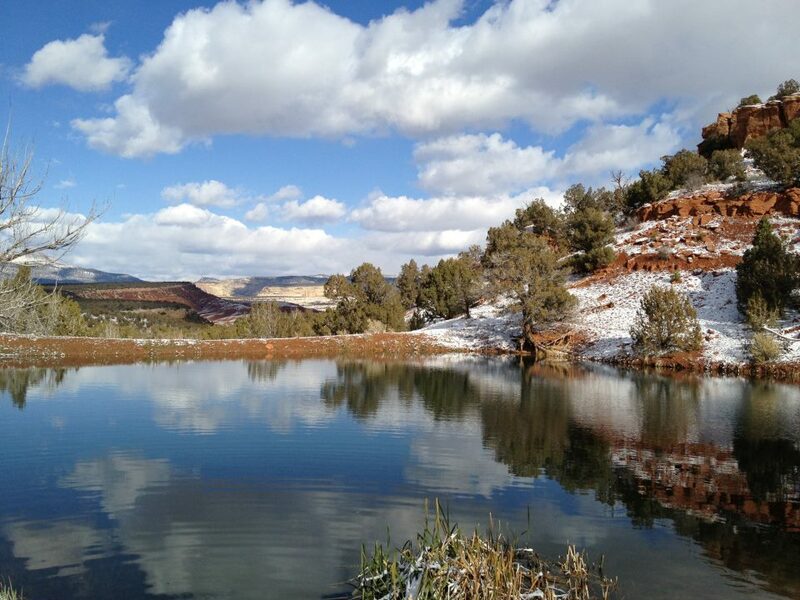 The Mantle Ranch is a 525+/- acre inholding within one of our nation’s largest parks. 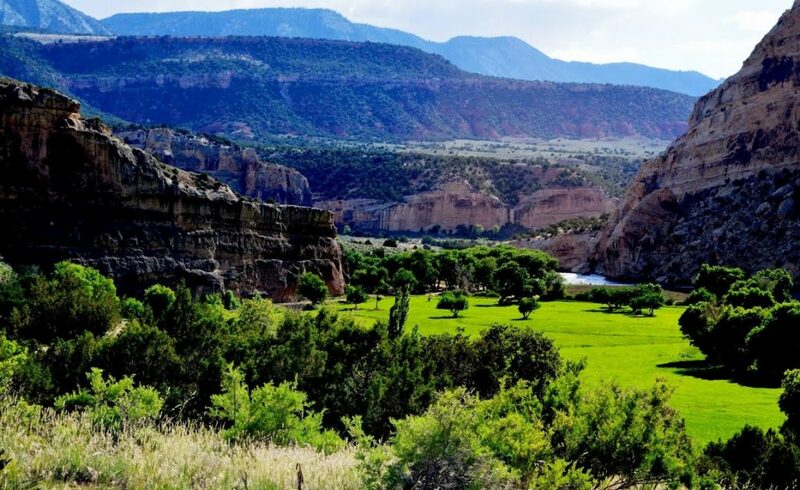 Surrounded by the geologically, culturally and paleontologically significant Dinosaur National Monument in Colorado’s northwest corner, the ranch has a rich history of Native Americans, explorers, intrepid settlers and owners drawn to the outdoors and the West. 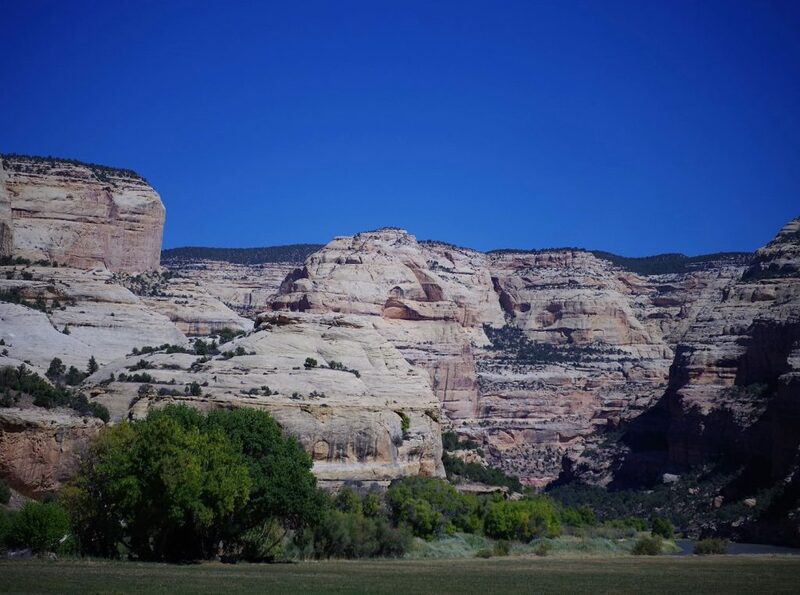 With magnificent canyons carved deep by wind and water, the ranch is nestled in a protected park along one of the serene stretches of the Yampa River. Modest, interesting improvements have provided shelter for generations. Varied topography with a wide range of elevations and microclimates have provided forage for cattle and horses for generations. Little has changed in this wild, natural part of the world. Seldom does a property become available that provides such an impressive front-row seat to a complete chronology of human, animal and geologic time. The Mantle Ranch is a one-of-a-kind property in a unique setting that cannot be replaced or duplicated.